General Hospital (GH) spoilers for Friday, October 27, tease that we’ll see pandemonium at the media company launch party. Griffin (Matt Cohen) and Ava (Maura West) grew concerned when they saw Dr. Klein’s (Gene Farber) thugs. Unfortunately, their warning came just a bit too late. Things are getting even crazier in Port Charles! Dante’s (Dominic Zamprogna) caught in a faceoff with these dangerous men, but he’ll try to stay calm. GH spoilers state that Dante will do everything he can to resolve this without violence. Of course, that plan won’t work out. Several people will be at risk during the chaos. For starters, there’s Sam (Kelly Monaco). She’s obviously the target, so she’ll be in the most peril. General Hospital spoilers say a drugged Sam will be kidnapped at this event, but Jason (Billy Miller) will put up a fight for her. He’ll get into a physical confrontation with one of the brutes. Shots will also be fired at some point, so the guests’ lives will certainly be at stake. Carly (Laura Wright) will manage to get in touch with Sonny (Maurice Benard) pretty soon. She’ll send an SOS and hope that Sonny can provide some much-needed backup. General Hospital spoilers say Sonny will fill Patient Six (Steve Burton) in on the news. He’ll urge his buddy to grab his gun and they’ll be ready to roll. The dynamic duo will be back in action as they race to the scene of the crime. Sonny and classic Jason will be determined to keep their loved ones safe. 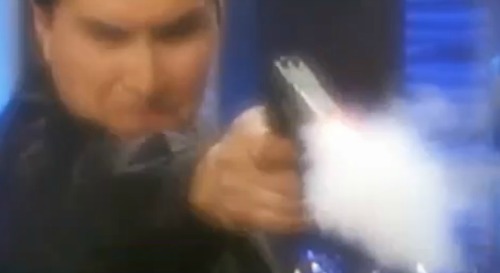 General Hospital spoilers reveal that Carly will end up with a gun to her head before the evening’s over. Thankfully, it seems Carly will walk away without any injuries. Meanwhile, Patient Six will begin the hunt for Sam. He’d never forgive himself if Dr. Klein’s thugs hurt or killed his love. Across town, Finn (Michael Easton) and Anna (Finola Hughes) will follow through on their promise. They agreed to have dinner with Mac (John J. York) and Felicia (Kristina Wagner), but this is going to be incredibly awkward. Finn will struggle to keep up the ruse as Mac and Felicia bombard him with questions. Anna will step in to smooth things over, so it appears their charade will continue for now. Elsewhere, Cassandra (Jessica Tuck) will refuse to take no for an answer. She’ll contend that she wants the best and only Valentin (James Patrick Stuart) will do. While Valentin mulls over Cassandra’s proposal, Franco (Roger Howarth) will consider the new evidence. Now that Andre (Anthony Montgomery) has provided a death certificate, he’ll hope that Franco can finally let Drew go. Still, there’s a good chance Franco will suspect that something’s off. It looks like GH will deliver some fantastic drama in Friday’s episode. We’ll give you updates as other details emerge. Stick with the ABC soap and don’t forget to check CDL often for the latest General Hospital spoilers, updates and news.